Chicken and dumplings is considered to be a comfort food. 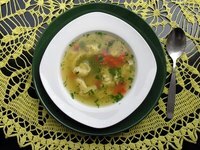 Basic recipes consist of chicken breast meat, chicken broth and dumplings. A mixture of flour and water or chicken stock is used to make the dumplings. After the chicken meat and stock reach boiling, the dumpling mixture is slid into the pot by rounded tablespoons. This dish can be frozen for later use. Cool the chicken and dumplings to room temperature. Remove the dumplings from the soup and place them into a gallon-size freezer bag. Extract as much air from inside the bag as possible. Pour the remaining soup into an airtight container and seal. Place both the dumplings and the container with the soup into the freezer. When you are ready to eat the chicken and dumplings, remove both of the items from the freezer. Place the soup contents into a large stock pot over medium-high heat and bring to boiling. While soup is heating, place the dumpling bag into a sink full of warm water. This will thaw and separate the dumplings. Remove the bag of dumplings from the sink of water and separate them into a bowl. Carefully slide the dumplings into the soup once it has reached boiling. Allow the mixture to come back to boiling temperature. Reduce the heat to medium-low and continue to simmer the soup for approximately 10 minutes. Can You Cook Dumplings Out of Pizza Dough?